Trade unions are developing strategies to address the harm a new generation of trade agreements may have on workers and access to public services in the Asia-Pacific region. Two new reports released this month by Transnational Institute (TNI) highlight the significant dangers which the Trade in Services Agreement could pose to State Owned Enterprises and Public Banks as well as examining the successful campaign in Uruguay to exit the negotiations. A new report by German lobby monitoring group Lobby Control has revealed the intense influence which corporate lobbyists are continuing to exert over the ongoing Trade and Services Agreement negotiations. Regional Meeting of Public Services International (PSI) Interamerica's Health Sector took place on 8 and 9 November in São Paulo, Brazil. 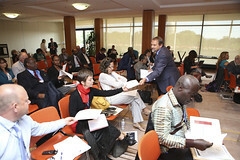 The meeting was considered as part of the reconstruction of the health policy of PSI at a global level. PSI's new publication on how unions and civil society allies pushed the Uruguayan Government to leave TiSA negotiations serves as a useful resource for activists in other countries and regions who may hope to do the same. A recently leaked proposal tabled by Turkey in the TISA negotiations argues for a system that promotes insurance reimbursement (for those who have health insurance) for treatment at lower cost in another country. 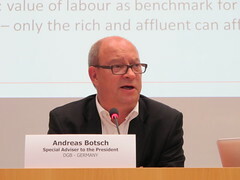 PSI’s Global Trade in Services Forum, From GATS to TISA, held in partnership with the Friedrich-Ebert-Stiftung (FES) and the Our World Is Not For Sale (OWINFS) network, held on 17 October 2014 in Geneva, Switzerland, is the first ever global conference to provide a critical perspective on the TISA. In order to influence the TISA negotiations PSI has developed a release strategy and campaign kit. A coalition of civil society groups and unions around the world has organised a global day of action on 18 April to demonstrate against the negotiation of harmful trade agreements. PSI endorses this day of action and encourages affiliates to participate. Public Services International (PSI), affiliate leaders and partners will convene in Washington, D.C., in September 2014 to discuss the new threats posed to workers, public services, democracy and our communities by trade and investment agreements. Public Services International is presenting a special forum at the 9th WTO Ministerial in Bali. This forum aims to shed light in dark corners: Why is a new services agreement required? Why must it be negotiated in secrecy outside the multilateral process? Why are so many developing countries refusing to participate? What benefit will it provide to the majority in the community? In this video Rosa Pavanelli, General Secretary of Public Services International (PSI), addresses the Conference of Speakers of European Union's Parliaments on 21 April in Rome, Italy. Ellen Gould, keynote speaker at PSI’s Global Trade in Services Forum, From GATS to TISA, held in partnership with the Friedrich-Ebert-Stiftung (FES) and the Our World Is Not For Sale (OWINFS) network. Ellen Gould is the author of the Special Report "The Really Good Friends of Transnational Corporations Agreement" which focuses on how TISA could be used to accomplish the deregulatory agenda. "Governments should be held accountable to promote the interests of their people ahead of the interests of powerful commercial interests", says Jane Kelsey, keynote speaker at PSI’s Global Trade in Services Forum, From GATS to TISA, held in partnership with the Friedrich-Ebert-Stiftung (FES) and the Our World Is Not For Sale (OWINFS) network. RadioLabour has prepared a special report on the global trade agreements: What they are and how they will affect working people. 12 min 18 sec ago.